How Lamp Post Helps You to Keep On Homeschooling. 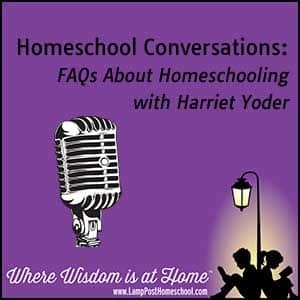 Interviewer Rob Vail of This Side of the Country Radio Ministry and Harriet Yoder chatted about How Lamp Post Helps You to Keep On Homeschooling. These mp3 audio files should open automatically. Now that we’ve allayed all the fears and we’ve made it so much more comfortable for someone to get into homeschooling, obviously they are going to have to visit Lamp Post Homeschool Store. What are they going to find when they either come to your store or visit the website? What kind of curriculum? What kind of things can they find? We have most of the popular homeschool curriculum that is available today. From the textbook, traditional “everything’s here for you” curriculum to curriculum that’s been designed by homeschoolers for homeschoolers. We want to help you find what is best for each child. We want to help you choose the curriculum that’s right for you and your child. A lot of times people will choose things, and I’m thinking they are not going to like this. I might suggest something else but they’re bent, they’re bound and determined to use this curriculum because somebody told them about it or they read about it. I know that a year later I’m going to see them. They’re going to come back and say I hated it. At that point, I tell them I didn’t think you’d like it and here’s why. Here’s what I think you will like instead. We have enough experience with people who come in and buy things and come back the next year. We ask them what didn’t you like it or what did you like? We try to help you choose something. Every day we talk to people on the phone and ask questions about what they are using and what they are looking for because we know the curriculum. We can usually help you to find something that will make your homeschool experience more enjoyable. It is fun to homeschool. When you get past the bad days that happen, it’s fun to homeschool. It is fun to see your children learn. It’s fun to be around them. It’s fun to know that these are children that are going to really make a difference in their world when they are adults.